Today, most innovation happens in high-tech laboratories and research centres. But Maker's Asylum sees thing differently! We’d like to see a world where ideas that shape the future come from our kids. After all, they do have the most imaginative minds. And so we came up with #STiTCH - a hackathon that encourages kids to express their innovation through hands-on and interdisciplinary learning. #STiTCH is devised on 3Cs - conceptualise, collaborate & co-create. The first session of #STiTCH was launched in Singapore for a select group of students and is now being presented in India. To give participants the best immersive experience, only 30 students will be enrolled per session. Participants will work in teams to create prototypes incorporating all their learnings, and can choose from an array of available tools, components, and materials. 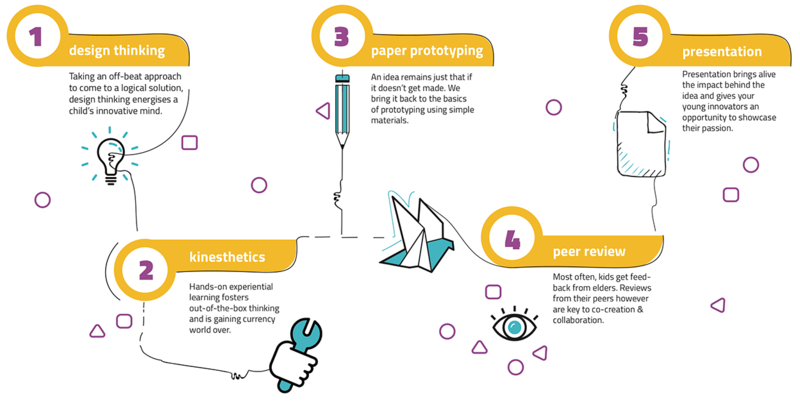 The emphasis is on think+build and the key is to deliver a prototype that could be wild and whacky but built from ideas conceptualised by the participants themselves. This brings in aspects of interdisciplinary learning which is now gaining currency globally. #STiTCH cultivates five key principles helping kids succeed as innovators later in life over the three days. Taking an off-beat approach to come to a logical solution, design thinking energises a child’s innovative mind. Hands-on experiential learning fosters out-of-the-box thinking and is gaining currency world over. An idea remains just that if it doesn’t get made. We bring it back to the basics of prototyping using simple materials. Most often, kids get feed- back from elders. Reviews from their peers however are key to co-creation & collaboration. Presentation brings alive the impact behind the idea and gives your young innovators an opportunity to showcase their passion.